2.1 A Murderer in the Jail? 2.2 A Bard in the Inn? Help Sibbi Black-Briar locate his former fiancee, so he can kill her. Lynly Star-Sung is secretly in hiding. Talk to Sibbi Black-Briar in Riften Jail. Locate Svidi and talk to her. Tell Sibbi the truth or lie to him. A Murderer in the Jail? Sibbi is planning to take action! 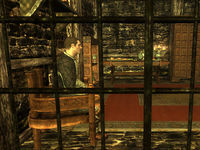 If you enter the Riften Jail, you will come across Sibbi Black-Briar residing in one of the jail cells. You may ask him how he ended up in jail, he will respond with: "Look, we all have our flaws; mine is that women can't get enough of me. So I had this little affair going on while I was betrothed to a beautiful girl named Svidi. Well, she finds out and she tells her brother, Wulfur. Then her brother attacks me with a knife... I mean, I had to defend myself"
Now, he is very angry about that girl. "I'd do anything to have that whore's head on a platter." All he needs to know is where she is. If you can help him find his fiancee, he promises you'll be well compensated. You may ask him for more information about Svidi. He will respond with: "She was a young woman... buxom, with long flowing black hair. She used to sing the most lovely songs to me when we were courting. I've never heard a voice so beautiful. All that talent will go to waste when I'm finished with her." A Bard in the Inn? According to Sibbi's description, you may find such a woman in the Vilemyr Inn in Ivarstead. 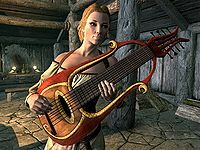 Now, she is a bard under the name of Lynly Star-Sung. You may tell her that you know she is Svidi, she will initially deny it. "No, I'm sorry. You must have me mistaken for someone else. I've never even heard that name before." You can now choose to persuade or intimidate her with your Speech skills. If you are successful she will continue: "Sibbi's been spreading lies about me, you must hear me out." You may ask Svidi to tell you her side of the story, she will reply with: "Sibbi and I were to be married. We were supposed to be happy together forever. Then I found that wretched poetry from Svana. When I confronted Sibbi about it, he threatened to kill me. I was scared so I told my brother Wulfur. He went to talk to Sibbi for me and... and... Sibbi killed him. My brother wasn't even armed! When I heard what Sibbi did, I fled. Now you've found me, and you're going to tell him where I am." Return to Sibbi and tell him you have got some information about Svidi. He will be very glad. "Good, good. Just point me in the right direction and I'll do the rest." At this point, you will have to make a decision: tell him the truth or lie to him. She's in Ivarstead using the name Lynly. Ivarstead? So close to Riften? She's an even bigger fool than I thought. She's made her way east into Morrowind. So, the whore thinks the Black-Briar reach ends at the border of Skyrim, eh? She'll soon discover her mistake. Never mind. I was mistaken. You idiot. You came all the way down here for that? Whichever option you choose between the first two, Svidi will not be killed, and Sibbi will give you his key to a long chest found in the basement (at the bottom of the stairs) of the Black-Briar Meadery in Riften, saying "You've done me a great service, my friend. Allow me to compensate you for the information." The chest will always contain one random weapon, a poison, and some gold, along with the Prowler's Profit gems, if applicable. Sibbi's gratitude will also allow you to take any low-value items from the meadery. On the PC, it is possible to use the console to advance through the quest by entering setstage FreeformRiften02 stage, where stage is the number of the stage you wish to complete. It is not possible to un-complete (i.e. go back) quest stages, but it is possible to clear all stages of the quest using resetquest FreeformRiften02. This page was last modified on 24 October 2018, at 06:51.